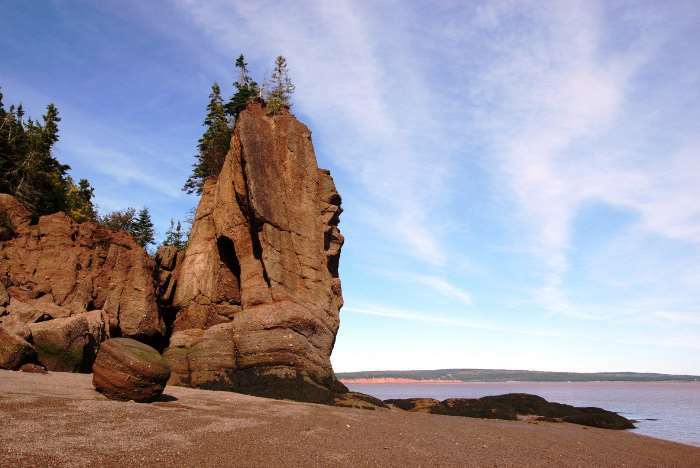 New Brunswick’s most recognizable scenery can be found along the coastline of the Bay of Fundy, at Hopewell Rocks. 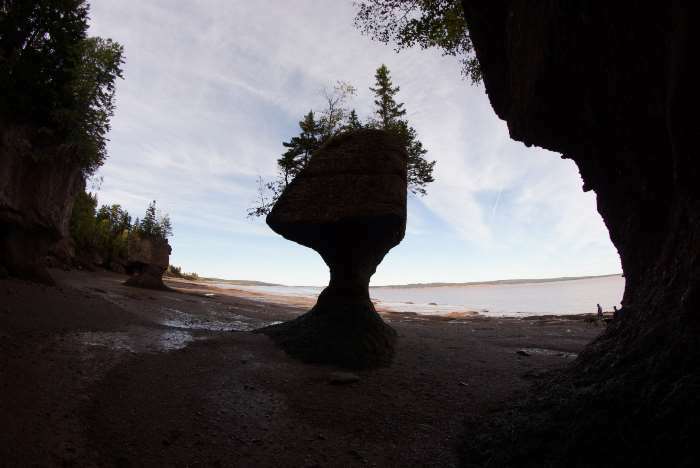 The mind-boggling variation between high and low tides have eroded the coast into other-worldly sculptures. When the tide is high, you can kayak around them, and when the tide is low, you can walk among them on the ocean floor. Just make sure you’ve planned your arrival to correspond with the tides, or be willing to wait around for a while. Hopewell Rocks is a provincial park located south of Moncton on Highway 114. 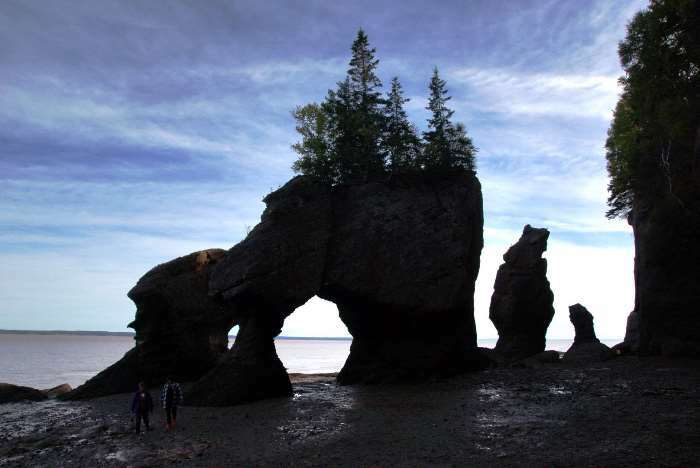 Don’t be confused: the Hopewell Rocks are not in Fundy National Park, which is about 40 kilometers further south on Highway 114. 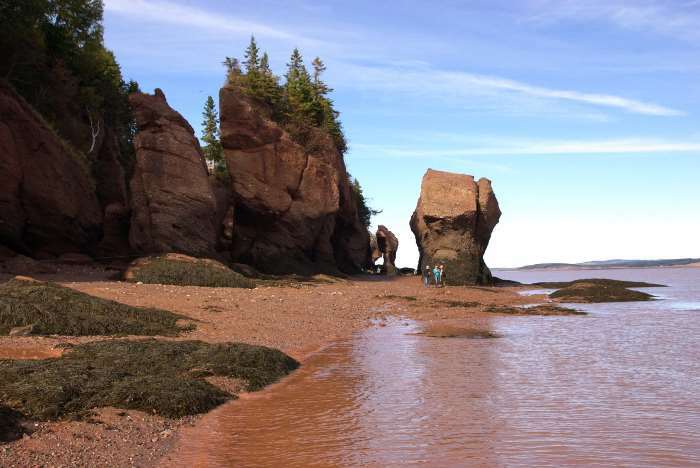 A visit to Hopewell Rocks begins at the parking lot – which is huge. You’ll park, and then pay your admission fee at the entrance gate. You can pay extra for a shuttle to the staircase, which might be worthwhile if you’re trying to save some time before the arrival of the tide. I had enough time to spare, so I chose to take the leisurely walk to the staircase. 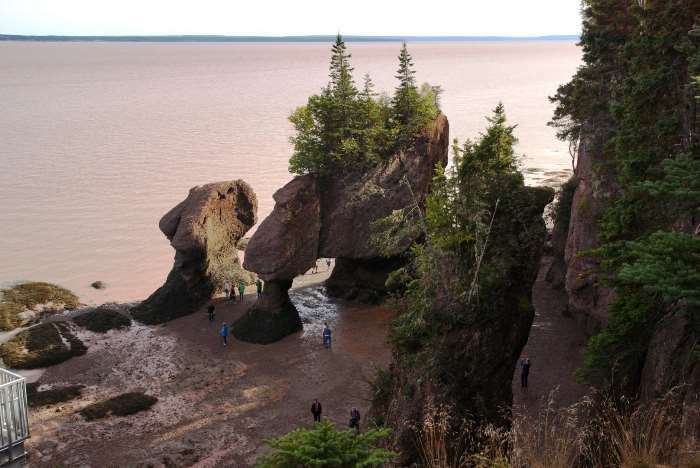 Along the trail, there are several viewpoints which let you look down on the Hopewell Rocks on the coastline. You’ll find this view at the top of the stairs. Speaking of which, there are about 100 steps that take you down to sea level. 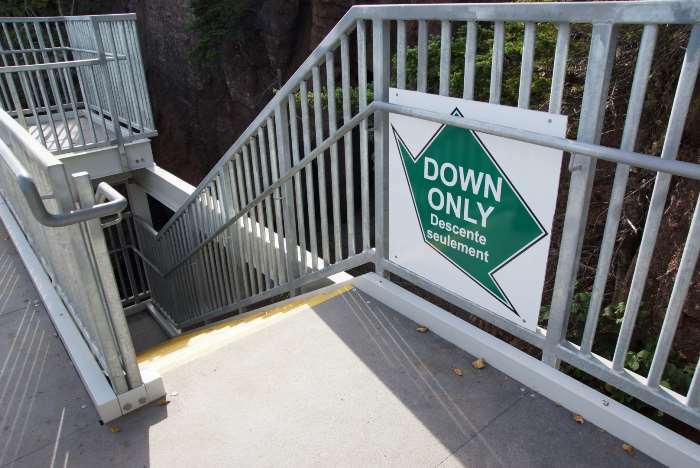 The staircase is thoughtfully divided into “down” and “up” sides, to keep the crowds flowing. Once you’re down on the coast, you really begin to realize why this is such a remarkable place. 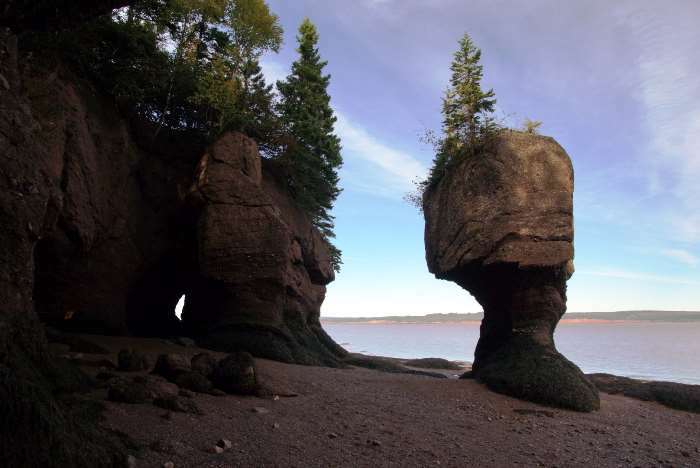 For this photo, I’m standing underneath rock that has been carved away by the churning tides, looking at another pillar of rock that is half-submerged when the tide rolls in. Evidence of the high tides is everywhere. 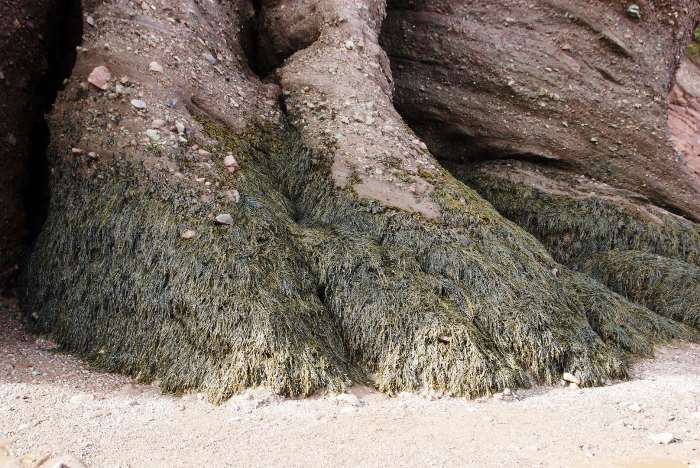 The sides of the cliffs look like elephants’ feet, and that seaweed marks the water level at high tide. It’s easily over my head. The depth of the high tide can vary, but it’s most dramatic during the new moon, at which time the tide can rise 14 meters (46 feet) above sea level. Once you’re on the beach, you can choose to walk north or south. The end of the staircase seems to propel people to head southward, which is what I did first. As you walk south, you’ll pass from one beach to another, by squeezing through some tight spots. Here, you see the landmark known as Elephant Rock (in the middle). It was much more impressive until March 14, 2016 — just a few months before my visit. 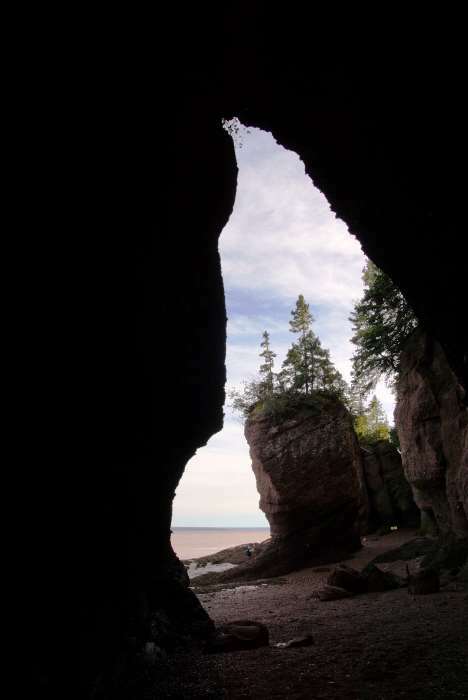 On that day, erosion, gravity, and springtime freezing and thawing took their inevitable toll, and about half of Elephant Rock crumbled, filling the narrow passageway between it and the other rock. 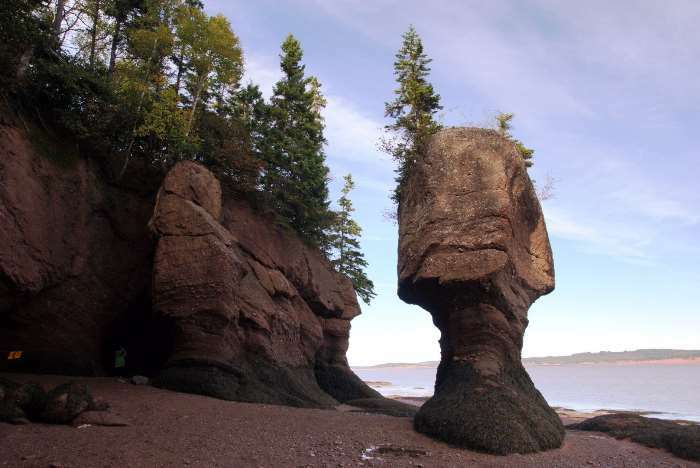 It was a heartbreaking loss for New Brunswick, since Elephant Rock was a well-known icon of the province (it’s even featured on New Brunswick’s Medicare card). After walking down the beach for about 20 minutes or so, I decided to turn around. Once I was back at the stairs, I realized that just about everyone was doing what I just did — hiking south, turning around, then returning to the stairs — but far fewer people were continuing north on the beach. So that’s the direction I headed, and suddenly, all the crowds of people who were getting in the way of my photos were gone. North of the stairs, the rock formations weren’t quite as big, but there were several of them, nicely sculpted at the base with trees sprouting out of the top. That’s why the formations in this area are known as the “Flowerpot Rocks”. While you need to time your visit to coincide with low tide (assuming you want to walk on the beach), you should also put some thought into visiting earlier in the day. This beach faces east, which means you’ll get much better light in the morning hours. I was visiting in the afternoon, and many of the formations were already falling into the shadows. 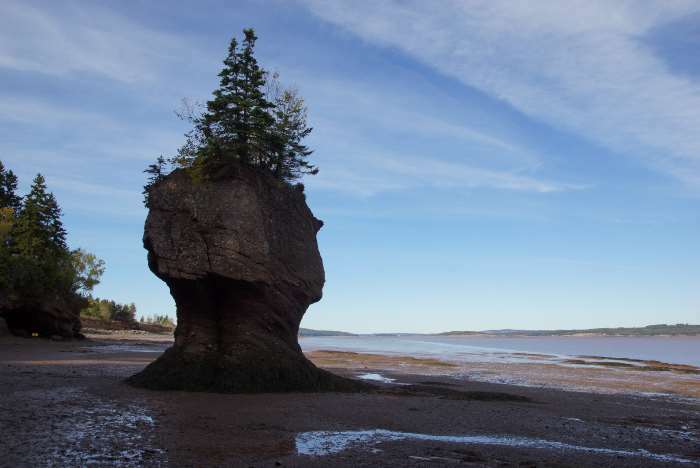 There are 17 standing rock formations at Hopewell Rocks, and I’ll let you browse through the slideshow at the top of the page to see all of the ones I photographed. 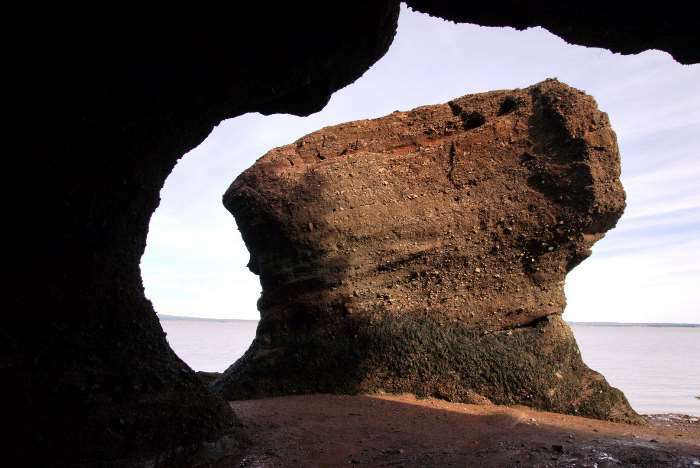 Along the way, you’ll see a lot of sea caves, and you’ll probably want to climb into them, but most are too dangerous. The park has roped-off many of them, unfortunately. 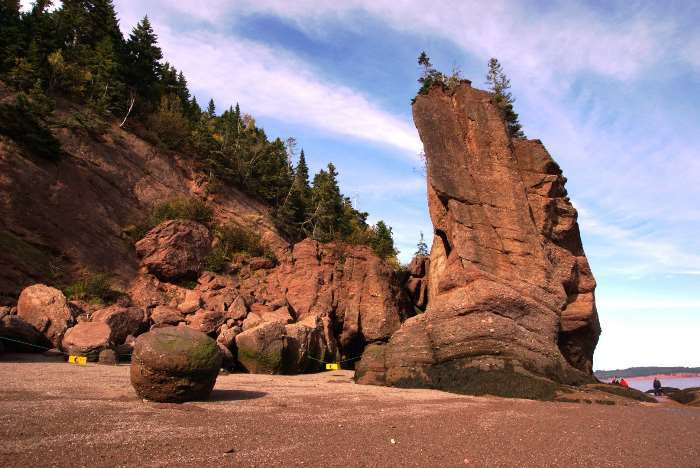 You can visit Hopewell Rocks in the winter, but walking on the beach is strongly discouraged. 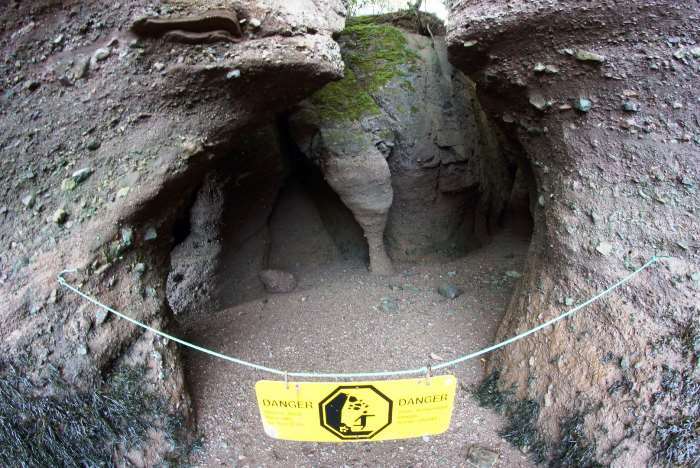 The park must remove all of the ropes and warning signs when it shuts down for the winter (the park is closed mid-October through mid-May). Also, the stairs to the beach are removed, to prevent damage from accumulating ice. If you visit off-season, it’s strongly recommended that you walk or snowshoe only on the established trails. Back at the stairs, Lovers Arch was getting very shadowy. 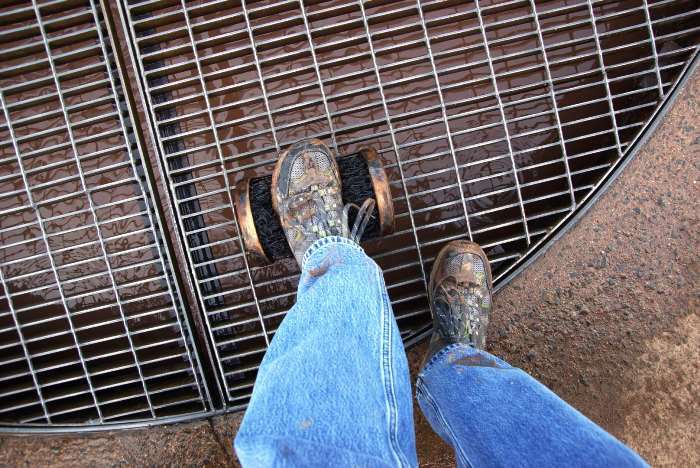 At the top of the stairs, you’ll find a much-needed spot to clean the mud off of your shoes. After all, you have been walking on the ocean floor. You didn’t expect that to be neat and tidy, did you? 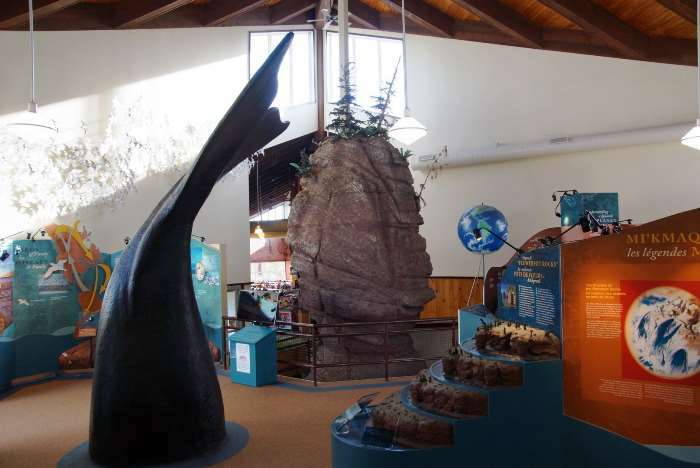 If you can successfully remove enough of the mud from your shoes, stop by Hopewell Rocks’ excellent visitor center and museum, where a whale’s tail emerges from the floor. 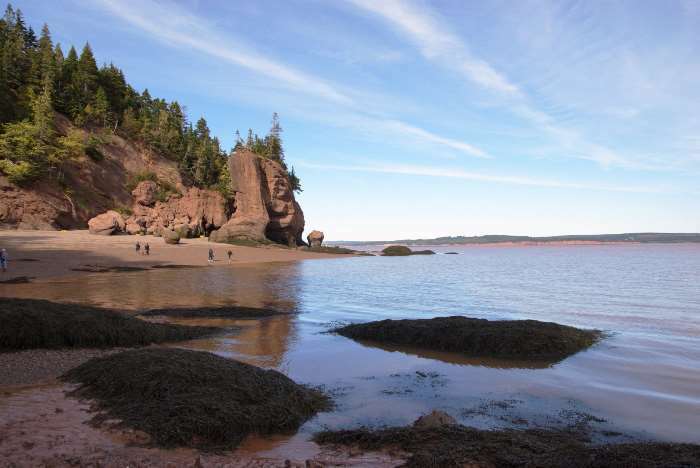 You should plan your day on the Fundy coastline around a visit to Hopewell Rocks. 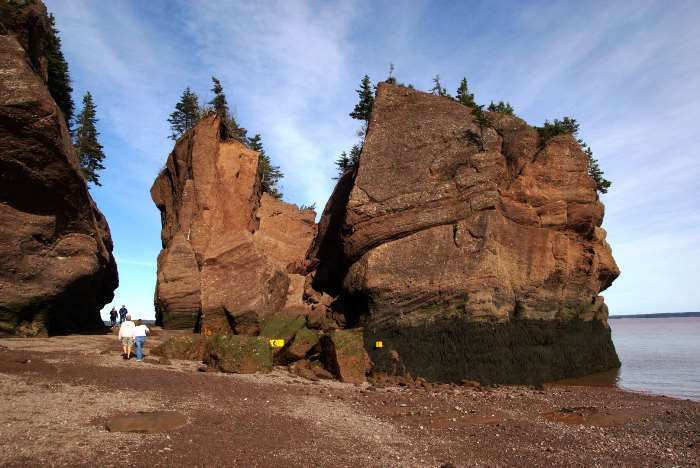 It’s the most interesting place you’ll experience in the area, and it’s an essential part of the New Brunswick experience. Check the tide schedule ahead of time, and if you want to walk on the beach, plan to arrive during low tide. And when you’re there, don’t forget to walk south and north from the staircase!